Water is scarce during the summer months and that’s when 40% of water is spent outdoors! Take advantage of those summer showers. Why not save your precious resources by using a Good Ideas, Rain Saver. Our rain barrels and other rain harvesting equipment will put every last drop to good use. Incredibly, 600 gallons of water will drain off of a regular 1000 square foot roof after only an inch of rain. What better way to be sure you have the water you need and with little effort! It is not advised to drink rain water stored in a barrel without using the AquaRain or another filter to remove contaminants. NEW PRODUCT! 3.5 Watt Solar Pump for Rain Barrels and Sprinklers $189.95 First of its kind! Perfect for "off the grid"--Good Ideas presents the world's first completely, self-contained, solar pump. This pump was designed with rain barrels in mind. Specifically made to work with low/no pressure systems. An 8 hour charge in direct sunlight can pump up to 100 gallons at a pressure reaching 13 PSI. The unit functions fairly easily with a simple, one-button operation to turn on, off and test. An indicator displays the charge of the NiMH battery. Operation is simple. Connect to the rain barrel using the included instructions, attach a hose, and turn on. The 3.5 watt solar panel comes with a ground stake and a 15 ft length of cord for convenient placement.The pump will work with a wide range of rain barrels as well as most low-pressure sprinkler systems and takes all standard hose fittings. Two optional locations for spigot placement. Change them anytime you want. If you want a rain barrel that doesn't look like the average rain barrel, Good Ideas has the right one for you. The Rain Wizard Rock is a 42 gallon rain barrel that has the appearance of a quarry rock. 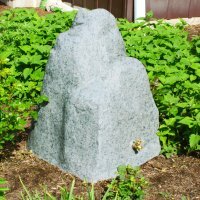 This rock will fit in with most any landscape arrangement and comes in 4 colors to appear indigenous in virtually every locale. Choose from Sandstone, Light Granite, Dark Granite, and Red Brick. The Rain Wizard 50 features an attractive Faux oak barrel design so it naturally fits in with your landscape. And the wide variety of colors allows you to even further match your barrel to your home and yard without standing out. Its plastic screen mesh is newly designed to keep out bugs, animals, and debris while still being easy to remove for cleaning and mainteneance and is gentle on skin. A front side overflow keeps water from flooding against your outside wall. The flat-back design is one of the most convenient features as it allows your barrel to sit right up against your home so you don't have to worry about purchasing excess downspout parts. Rugged design holds up under weight and weather, resists fading, bulging, and bowing. Able to conserve water, house flowers and look stylish all at once, the Rain Wizard 65 Gallon Rain Barrel Urn is a smart choice for your backyard. It's constructed from thick, durable polyethylene resin which holds up to the harshest elements. This barrel won't fade, crack or splinter. It has a natural-looking terra cotta finish to make it look right at home in its outdoor setting. A graceful shape and attractive details on the exterior make it an accent piece in addition to something that's working hard for you.This rain barrel has a flat back design to optimize space. It will sit flush against walls, giving you greater flexibility on where to place it. The top of the barrel not only acts as planter space, but also features a unique watering system that leeches excess water from the barrel itself. It's the only one of its kind. There is also a channel built into the rim to divert overflowing water to the front, away from the barrel and your home's foundation. The Compost Wizard Hybrid revolutionizes the way we do gardening. The innovative design cuts down cost (compared to buying a Rain Wizard 50 and Compost Wizard Jr) and also saves space by reducing your footprint. But even more, the whole unit works together to fuse earth and water. As the top barrel is rotated, gravity and centrifugal forces squeeze out excess liquid from the compost which flows out onto the base where it's channeled into the barrel. From there it mixes directly with the rain water collected from your gutters forming nutrient packed plant food. Five colors as shown above. Never worry about running out of water for drinking, cooking, bathing, flushing! When it comes to saving water, few water solutions compete with the massive capacity of the Rain Wizard 300. This behemoth is equiped to capture and hold over 300 gallons of rain water. The flat back design allows the 300 to sit flush against structure walls so incorporating your downspout is simple. This design also helps hold the structural integrity of the barrel. The smooth, durable screen keeps out pests and can be removed for cleaning access. The Rain Wizard 300 comes with two hook up locations to connect any standard threaded spigot. Use the lower connection for hoses and the higher location for buckets and other containers. Comes with overflow on the front to allow excess water to escape. For serious water conservation, the Rain Wizard 300 is THE solution.